Nowadays, Smartphone turns to be equipped with larger screen, higher resolution, and perform faster than ever. As the frequency we use Smartphone is getting increasingly higher, having enough battery is very important. However, the battery technology is still behind the demand. There are two main solutions for increasing battery that almost all Smartphone manufacturers used. One is by using larger battery, and the other is by fast charge technology. In comparison, fast charge technology enables battery to acquire full energy in a short time, sparing the trouble of adding extra weight to battery. Three fast charge technologies have become mainstream on Smartphone manufacture. They are VOOC, Quick Charge 3.0 and Pump Express. 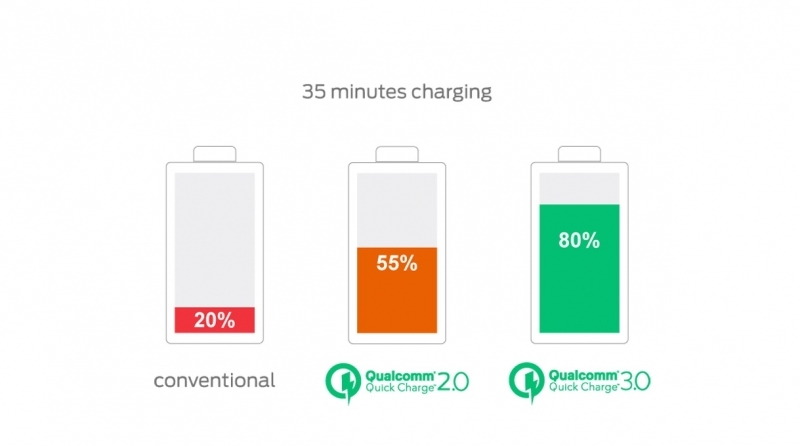 Qualcomm’s Quick Charge technology has been developed into its third generation. Unlike Quick Charge 2.0 with fixed voltage output, Quick Charge 3.0 employs Intelligent Negotiation for Optimum Voltage (INOV), an algorithm which allows portable device to determine what power level to request at any point in time, enabling optimum power transfer while maximizing efficiency. Quick Charge 3.0 is designed to refuel devices up to four times faster than conventional charging, which is twice as fast as Quick Charge 1.0 and to be 38 percent more efficient than Quick Charge 2.0. Quick Charge 3.0 is 100% backward compatible with Quick Charge 1.0 and Quick Charge 2.0 devices. It is highly compatible with different ports, such as USB Type-A, USB micro, USB Type-C and customized ports. Besides Snapdragon820, Snapdragon620, Snapdragon618, Snapdragon617, Snapdragon430, there will be more Qualcomm chips embedded Quick Charge 3.0 technology. Pump Express is a fast-charging technology developed by MediaTek, which can recharge a battery 2x as fast as a standard charger and can give a 75% charge in around 30 minutes by building into a devices power management integrated circuit or charger IC. Pump Express is available in two forms–Pump Express for mains chargers with an output of 10W(5V) or less and Pump Express Plus for chargers with an output power of up to 24W(12V) or more. No special cables are needed and Pump Express-enabled devices are compatible with existing USB mains chargers. However, fast charging is only available when using a Pump Express-enabled charger. Recently, MediaTek releases its new Pump Express 3.0, which can charge a smartphone battery to 70% in 20 minutes least. By comparing to Pump Express 2.0, it cuts more than 50% power dissipation and lower phone temperatures when charging. It will be available in the MediaTek Helio series P20 with devices expected to be in the market by end of 2016. VOOC adopts high current and low voltage model, which can get the mobile phone charge to 75% of battery in 30mins. It’s claimed that with 2-mins charge, it can support 2-hours call. VOOC technology is based on a whole set of customized circuit, cell, port, wire, and smart MCU adapter, which does not match other Smartphone. As there are no revolution battery technology coming out, fast charge remains the best solution for extending battery life. In the future, It can be speculated that more and more intelligent devices will adopt fast charge technology and the development of this technology will have a outburst in the near future. Don’t miss any of our future video tutorials, follow us on Youtube. Like us on Facebook. Add us in your circles on Google+. Watch our photo albums on Flickr. Subscribe now to our newsletter. Biggest http://ghchjgv.blogspot.com /search/label/firmware" target="_blank">firmware download center. you just read the article about 3 Fast Charge Technology You May Not Know and can you bookmark or share with link https://ghchjgv.blogspot.com/2016/09/3-fast-charge-technology-you-may-not.html so thank you.